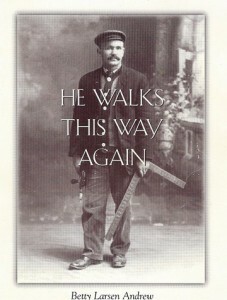 HE WALKS THIS WAY AGAIN is the story of George (Jørgen) Larsen’s life as an immigrant in the United States from 1904 to 1959. 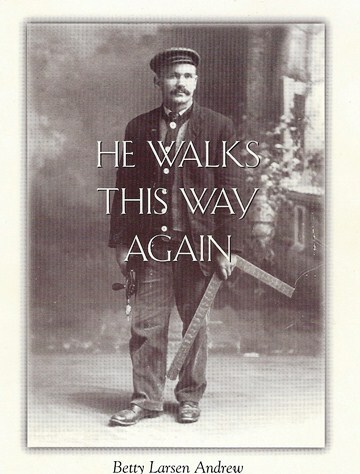 Though a carpenter of modest means, he was known as a knowledgeable and colorful personality in Michigan, Iowa, Wisconsin, and Illinois in the first half of the twentieth century. He also served as a sergeant in first World War in France. Most of his story was recorded in the little journals he constantly carried, writing first in Danish and then English as he learned the new language. He related the importance of the railroad, horse & buggy, mail, building details, and silent movies. In other words, everything he saw, experienced and read. Betty Larsen Andrew wrote her father’s biography to keep our family’s story alive for future generations. Betty enjoys a snack and listens to the birds with her father. 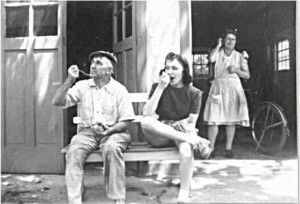 Her mother Matilda Hein Larsen is in background in Loves Park, IL. Copies available for $10.00 plus shipping and handling. 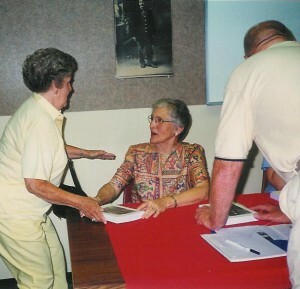 Biography of Betty Larsen Andrew. Pedersen, Lisbeth andMads Findal Andreasen. The Escape to America. Kalundborg Regional Museum, Denmark. Translated into English by Jesper Wind. The story of fellow Danish immigrants who probably knew George, August and Ane Rasmussen in Greenville, Michigan . Pedersen, Lisbeth. Wanderlust and Homesickness. Kalundborg Museum, 2004. Translation by Freddy Volmer Hansen of Pedersen, L.: ”Udlængsel og hjemve – en dansk tømrersvends erfaringer som indvandrer i USA i begyndelsen af 1900-tallet”, in Fra Holbæk Amt 2004 (Vejlø Print, Kalundborg, Denmark, ISBN 87-87575-27-2).